We don’t need to tell you how hot it is outside -- we’re sure the beads of sweat currently dripping down your forehead are a solid reminder -- so if you’re going to spend time outdoors, you damned well better be submerged in a body of water while doing it. In a perfect world, we’d each have access to a private pool, but since ever-increasing rent prices have warranted even certain shanty towns unaffordable, most of us will have to settle for simply renting a place with a pool for the weekend instead. 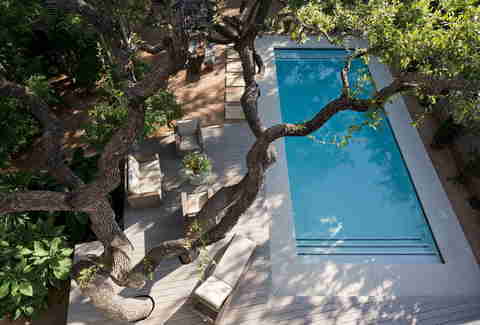 Here are a few of the finest pool-equipped Airbnbs in Austin. Pick one, be the best houseguest you can be, and take a well-deserved water break. Wanna get away? 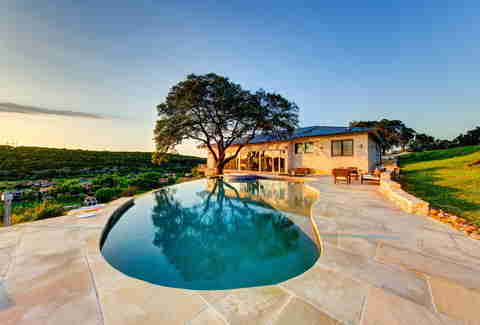 Ditch the cubicle and soak up some seriously sublime views at this 2,300sqft Hill Country villa. Unlike many Airbnbs, where you have to tiptoe around present homeowners, the guest house -- equipped with a gourmet kitchen and elevator -- and pool are exclusively for you and up to 10 friends for the weekend. That means total privacy for your definitely wet, maybe wild, weekend. 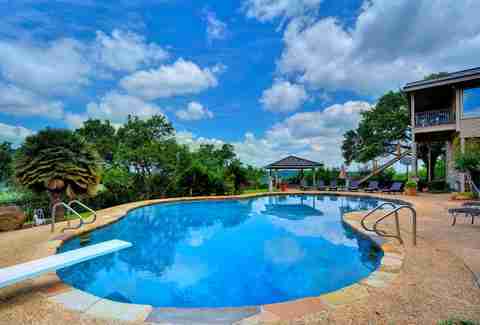 Sitting on 10 sprawling acres is the Cano Cabana, a gorgeous cottage complete with jacuzzi, outdoor fireplace, massive furnished and shaded patio area, and the star of the show, a resort-worthy pool accented with waterfall. Private, lavishly decorated, and surrounded by palm trees, this spot exudes some serious vacation vibes begging you to BYOCB (bring your own cabana boy). Kick it old-school at this elegant 1940s estate situated right in the heart of Austin. 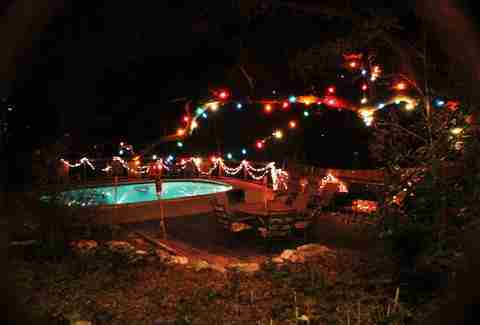 Secluded and shaded by trees, the ¾-acre property features a large deck and patio furniture perfect for poolside hangs, along with festive lights to keep the party going long after the sun goes down. Meanwhile, head inside and you’ll find bonus amenities, like a grand piano and -- we kid you not -- a massage room, where guests can spring for a discounted 60- or 90-minute massage from the host, a licensed massage therapist. Situated in Bouldin Creek, this small, sleek, three-story studio would look right at home on the pages of Architectural Digest. The top floor of the “modern cube” offers Downtown views, while the ground floor is where you’ll find the screened-in porch with grill, and a rectangular pool that’s perfect for quick morning dips and aquatic afternoon lounging. As a bonus, the host even provides two bikes… not sure why you’d ever want to leave. While the words “West Campus” may conjure images of college life and PTSD flashbacks of frat parties gone awry, this particular spot is enjoyable for those of every age. Show off your acrobatic skills, or lack thereof, on the trampoline, then make a grand aquatic entrance by way of the sweet water slide that’s almost awesome enough to make you feel like you’re at Schlitterbahn. No wristband required. While we recognize that $1500/night isn’t exactly chump change, based on the looks of this gorgeous, glassy infinity pool, the chance to submerge is probably worth the splurge. Nestled high on a hill overlooking Lake Austin, the private resort also boasts sun decks, a BBQ grill, a jacuzzi, and a private, two-story boat dock (accessible by tram), all surrounded by Instagram-worthy scenery that, trust us, definitely requires #nofilter. Life just looks better from the edge of an infinity pool. 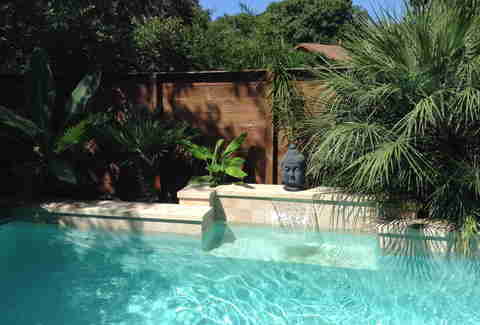 Located a few blocks from South Congress lies this “hideaway guest suite” with a shaded saltwater pool surrounded by lush tropical greenery and artistic touches. Ritzy perks like Turkish robes and toiletries contribute to what many have rated a five-star experience, while sharing the pool with occupants of the other guest house presents potential for some serious chicken-fight action. Get your zen on and zone out at this contemporary, eclectic home in Northwest Hills. Whether you’re catching some rays from the backyard watering hole, enjoying the fresh air while looking out from the elevated deck, or sipping, snacking, and socializing in the outdoor dining area, the flora and fauna make for an excellent oasis mere miles from Downtown, and a spot that you’ll wish you could call home. You only have to head a little bit south to enjoy this cozy neighborhood studio unit with access to a sparkling pool and adjoining jacuzzi, both of which look even more inviting when lit up and glowing at night. It’s also worth noting that there’s a pond with goldfish on the premises, and, while it certainly adds to the scenery, swimming in that body of water isn’t exactly recommended. Sam Sumpter is an Austin-based writer who totally got a five-star review on Airbnb one time… and, let’s be real, probably never will again. Follow her aquatic (mis)adventures at @Sam_Sumpta.